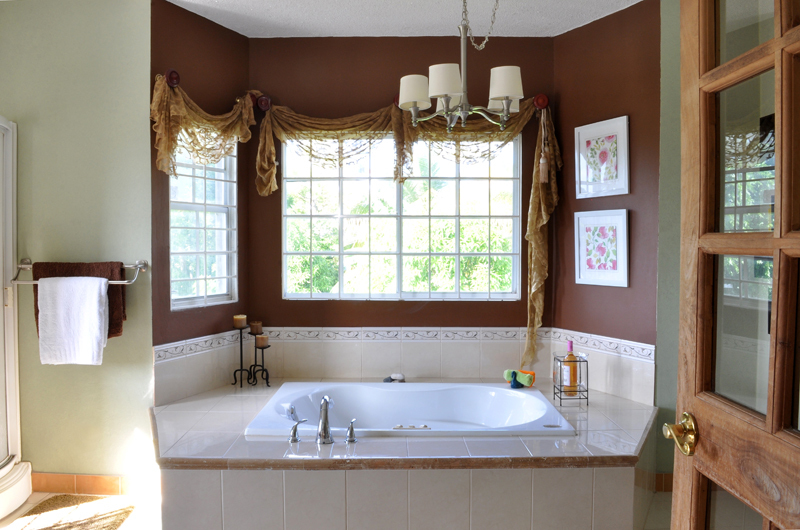 KAY’S BATHROOM RETREAT | Montego Bay, St. James The jacuzzi, nestled in its chocolate accented bay and wide open view beyond, is how you are greeted when entering the bathroom from the walk-in closet and dressing room. The soft, sheer valances frame the large windows and views of the rolling hills beyond. 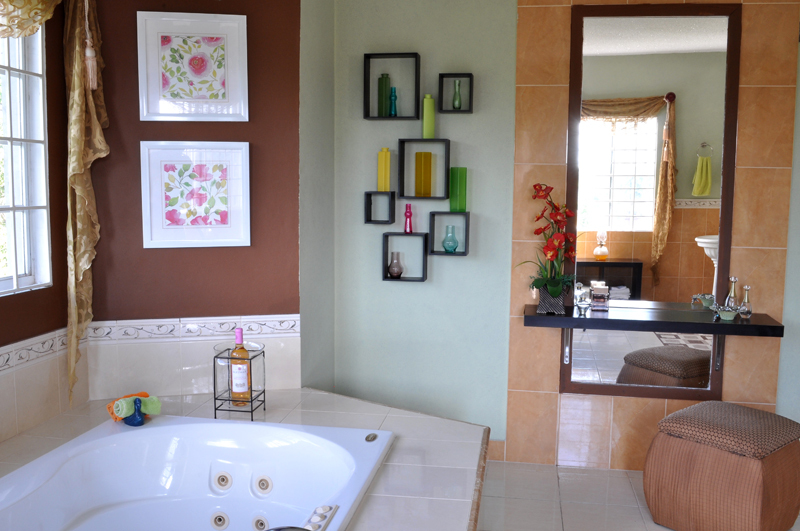 KAY’S BATHROOM RETREAT | Montego Bay, St. James The mirror reflects the jacuzzi and shower. The high gooseneck faucet allows for splash-free tub filling, as well as, detaches as an extendable shower head to facilitate bathing and easy tub cleaning. 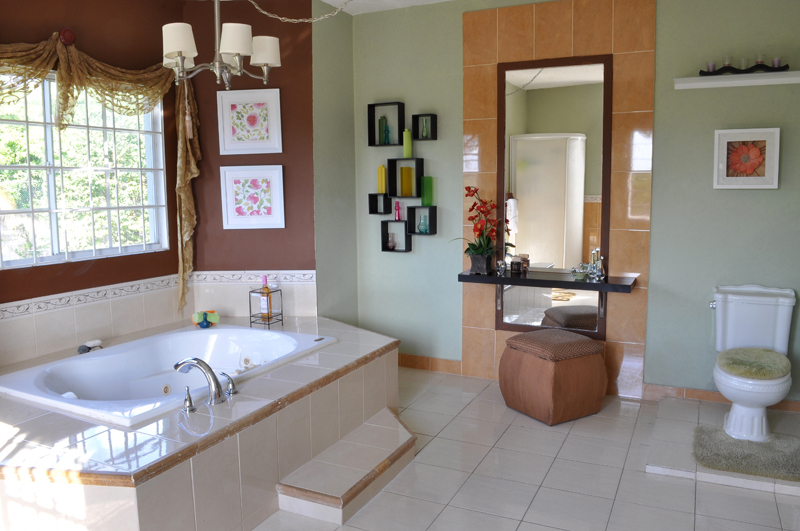 KAY’S BATHROOM RETREAT | Montego Bay, St. James Located high in the mountains, privacy is not an issue. The large windows bathe the space in natural light. 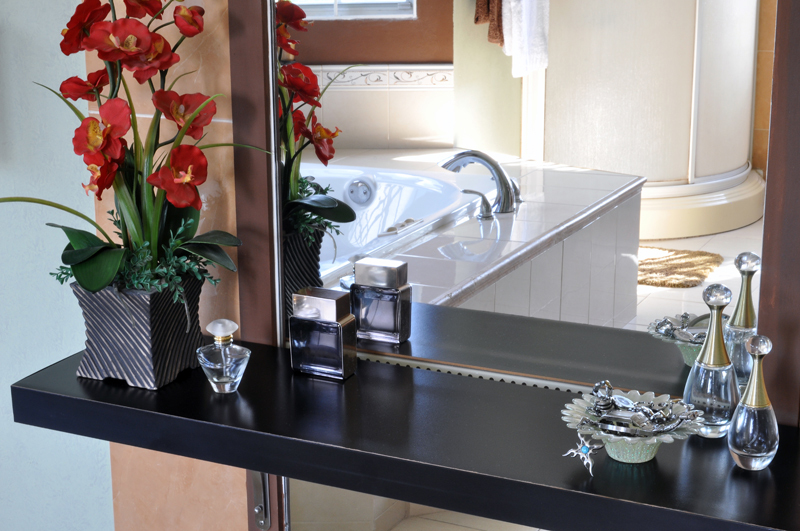 The separate vanity areas are linked with the use of a single throw rug. 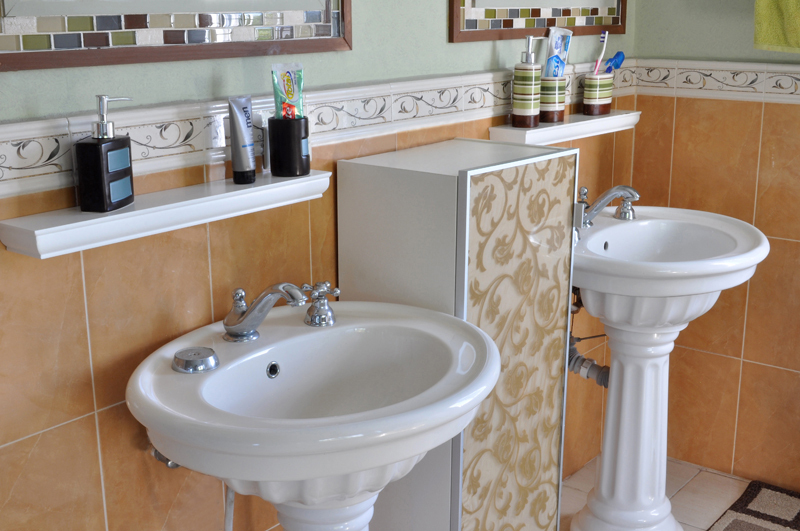 KAY’S BATHROOM RETREAT | Montego Bay, St. James When opting for pedestal sinks, countertop space and cabinet storage are often a challenge. We addressed these issues with the central storage unit and floating shelves over each pedestal sink. 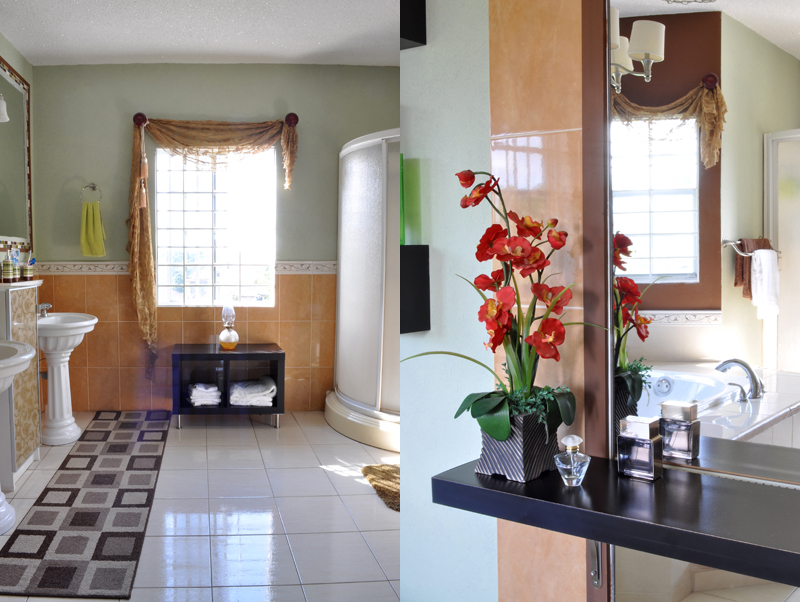 KAY’S BATHROOM RETREAT | Montego Bay, St. James All our spaces are designed to function, while providing aesthetically stunning views. Here the soft two-toned green walls are pitted against the dark chocolate alcove. The valances echo the motif of the border tiles. 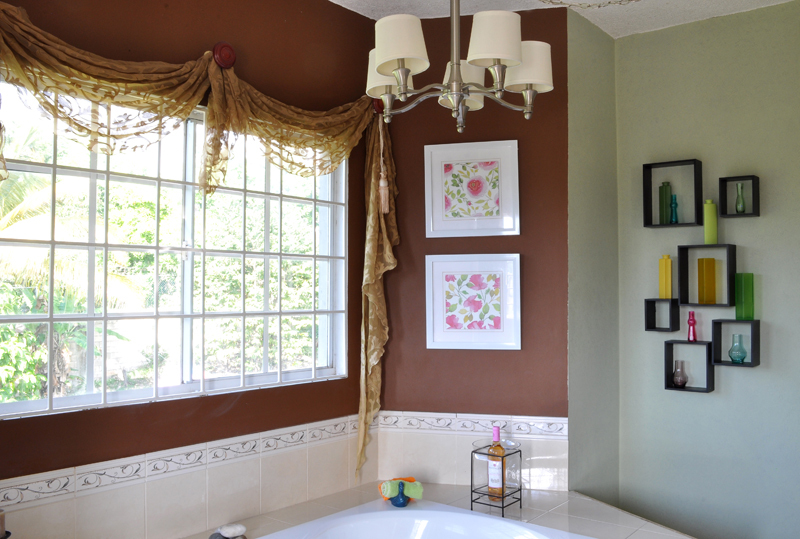 KAY’S BATHROOM RETREAT | Montego Bay, St. James The large wood and tile framed mirror, while dividing the tub and WC, add depth and interest to the bathroom. The shelf and ottoman creates a small dressing table. The ottoman also provides additional storage for toiletries. KAY’S BATHROOM RETREAT | Montego Bay, St. James The dimmable chandelier above the jacuzzi utilizes amber flame lamps to give the glow and feel of candles. The lamp shades further softens the effect. Brown marble moulding edge trims highlights the shape, angles and edges of the jacuzzi platform and step for added safety.